WordCamp Europe 2015 is over. Writing this post has been on my to do list from the moment I knew I was able to join the organizing team for 2015, so let’s get started and let me tell you more about my experiences. A solid and experienced organizing team is the base for a successful WordCamp. Organizing a WordCamp Europe requires a large team to make sure everything runs as smooth as planned.This years team consisted of the distributed WordCamp Europe team together with the local WordCamp Sevilla team. In Leiden (2013), Paolo Belcastro and I were responsible for the volunteers, 50 volunteers that is. This year Luca Sartoni and Rafael Poveda joined me to manage 65 volunteers. During the planning phase, Rafael, Luca and me communicated through weekly meetings on Slack and private messages. Meeting each other before the event felt like we knew each other for years. This resulted in very good understanding of how we work individually and what we could expect from each other during WCEU. After we opened up volunteer registration, we were immediately overwhelmed by the speed and amount of people who wanted to volunteer. This was awesome, as we knew we needed around 70 people to manage all tasks and be sure registration of attendees on day one was not going to slowed down by a shortage of volunteers. For during-the-event communication we used, yes there it is again, Slack. I started a new team and invited all volunteers and the organizing team. Immediately there was interaction between the volunteers, which was great to see! Because of the free wifi in the venue, people were easy to reach and could use all nice functions of Slack. Well, we just used it to chat, but that sounds nice doesn’t it? It just worked. Volunteers were aware of their role(s) during the two conference days and could use a Volunteer Roles spreadsheet as reference. This was communicated as a DropBox link through Slack. When briefing started at 7am on friday, all volunteers knew what to do. THEY TOTALLY ROCKED!! We have had so many pro-active volunteers that, in the case of a question/problem/challenge, we as “managers” were always too late to ask if someone could help. Volunteers just happen to be able to help. Problem solved. Everybody happy. Happy. That’s a word I want to emphasize. The whole organizing team is happy about all the volunteers and how they (or should I say we?) managed to help facilitate such a wonderful event. The local team really helped in making things work. They knew where to go for diner, what to coolest touristic places were, where to rent bikes to cycle around town and where to find a great location for the WordCamp Europe 2015 after party. Thanks to their knowledge of Sevilla, the local way of doing business and of course the Spanish language, we made it possible for everyone to have good time while in Sevilla, either in the conference areas or outside playing tourist. As an organiser it’s sometimes hard to find time and peace to go to a talk an see it from beginning to end. 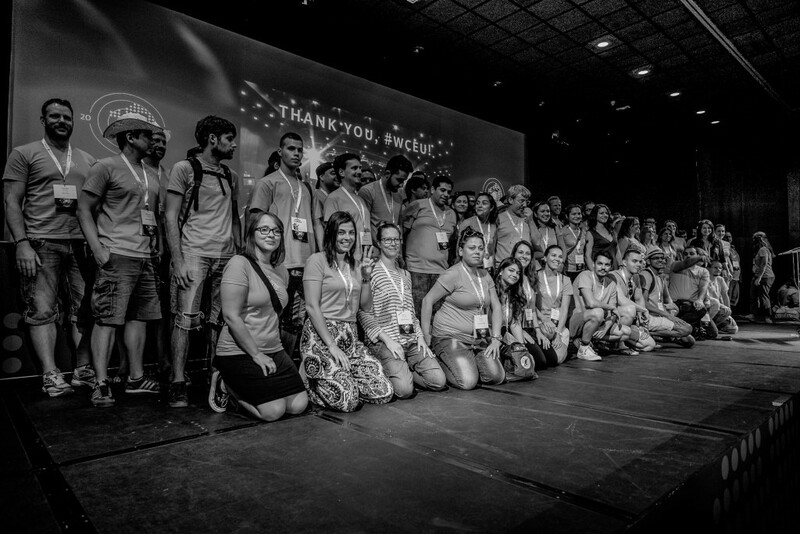 This years WCEU was normal, in which I can say I have only seen two complete talks; Matt’s Q&A and the DiversITy Matters talk from Juliette Reinders Folmer and Wouter Groenewold. I’ll lookup the other talks on wordpress.tv, when they are published. The diversity talk was one of two last talks of day 2. I joined their talk not just because both speakers are fellow Dutchies, but mainly because I talked to them a lot after the speakers dinner and between sessions, which made me curious to see and hear what they had to tell. From the introduction to the end of the talk I was engaged with both speakers. Juliette is an experienced speaker and together with Wouter she managed to grab the audience attention from the first few sentences. They talked about experiences in the IT industry and Wouter talked about his past. In that past he was bullied a lot. Now he doesn’t want to be ‘victim’ anymore, he wants to show what can be done to feel welcome. Wouter, you rocked on stage! I was emotionally touched by their talk in which I ended up hugging both Wouter and Juliette on stage after their talk to thanks them, and to show my appreciation for their very well done talk. Thanks to both of you! After the first attendees entered the venue and gotten their badges, feedback started getting through. All I have heard is positive feedback, telling us how well organised everything was, that the food is great, how good it is to have live translation, that the watertaps are refilled often and of course that the wifi is going on/off/on/off/on/off (hey it’s a conference). This kind of feedback makes organisers fly. We think of a lot of things to make it the best experience for everyone, whether you are a speaker, sponsor, volunteers or ‘just’ an attendee, and what better way to thank us by telling how great everything is. If you have some more feedback, just comment on this post. I love to hear from you. What is a WordCamp without people? Very quiet..
Every WordCamp we meet new people and refresh existing relations. It doesn’t matter whether you are a junior developer or the head of some mega-big-WordPress company, everybody has an open attitude towards meeting new people and talking with them. That exactly is what makes this community what it is. Language and cultural differences, sexual preference, diet requirements, religion, none of these elements prevent us as a community to connect and cooperate. And with cooperation we help each other to reach our goals. Vienna. WordCamp Europe 2016. What can I say. After not being able to join WCEU in 2014 in Sofia because of the first birthday of our daughter Mila, I just had to be at the 2015 edition. Together with my wife Beatrijs, who some of you have met in Sevilla, I arrived on wednesday before WCEU. From that moment on I lived in a dreamlike phase of happiness and joy. Beatrijs learned how close we all are in this community and she has had good conversations with a lot of fellow professionals. Finishing this post is like a psychological closure of WCEU 2015. But, since I just can’t delete the #wceu twitter column in TweetDeck, the feeling of happiness will remain for a few weeks. 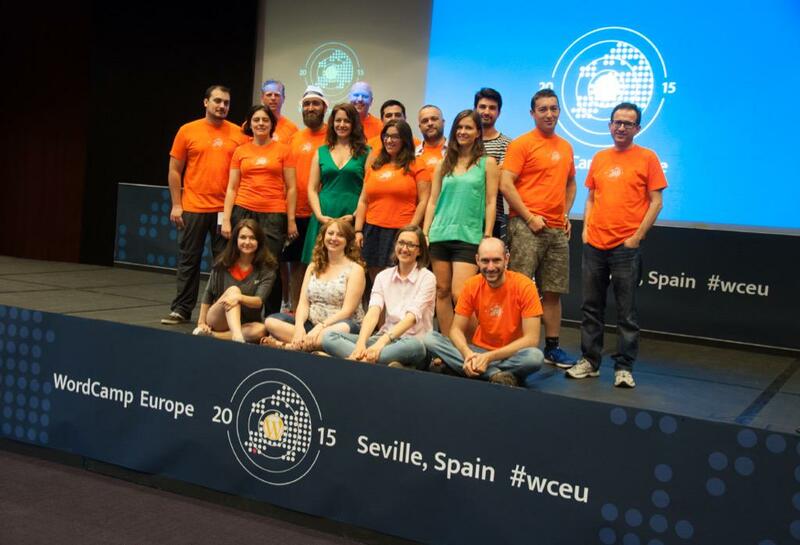 Great post and insightful to see WCEU through the eye of someone in the organisation team. Thank you for your kind words about our Diversity Talk. I’m so glad it touched people in a constructive way!